Karen Koch is and continues to be one of Sparrow Schools’ longtime friend and an Educate A Child supporter. We caught up with her to get to know her better and what inspires her passion for our Educate A Child programme. Q: How long have you been involved with the EAC programme? A: I’ve been involved for about two years now. Q: Why did you choose to get involved with Sparrow Schools and EAC? Why does this cause matter to you? A: As part of a middle management development programme at work, teams were assigned an NGO to work with, and Sparrow Schools was one of them. Although I wasn’t part of the team that worked with Sparrow, one of the team members told me about the work you do and I was inspired to start getting involved. I believe that the only way to alleviate the poverty and help reduce crime in SA is by educating people so that they are able to find employment. By educating people who would otherwise have been failed by the system, and especially through the apprenticeship programme, Sparrow is doing something tangible to make our country a better place. At about the same time, I also heard a guy who had previously been homeless but had then been to your chef school, call in to Radio 702 to ask for work in a professional kitchen, and someone offered him a job on the spot. It was truly heart-warming. Q: How important do you think giving back is? A: Firstly, I believe it is a Biblical principle – I am only a steward (not the owner) of what I receive, and it is my duty to help those less fortunate. Besides being a duty, it is also a privilege to help others who are not as blessed as I am, and by doing so, equip them to one day be in a position to bless others. Q: How has your involvement with the EAC programme contributed to your personal growth? A: We arranged a team from work to help paint one of the classrooms on Mandela Day 2013, and I’ve also been to a graduation ceremony. I was blessed just being part of those events. It truly is a blessing to see the difference Sparrow makes in the children’s lives. I’ve also participated in the 2013 and 2014 Discovery 702 Walk the Talk events as part of the Sparrow team, so it’s not only good for my soul, but my physical health too! Q: What are the most critical results you expect our organization to produce? A: To equip children of all ages (particularly those who would not otherwise have had the opportunity) with the skills they will need to one day be productive members of society. Q: If you could change the world, what would you do? A: I would want everyone to be loved and to live with dignity, to have enough to meet their needs and to contribute to society by helping others. That sounds very simple, but I believe there are many people who don’t have that and may never get the chance to get it. And it humbles me, because I am fortunate enough to be very blessed. Q: What actions do you think would best cause the change you envision? A: Partnering with Sparrow is one of the ways in which I try to make the world a better place. I may only help a few children, but they will go on to help others. If everyone did something, it adds up. Q: What would you like to pass on to future generations? A: I’m reminded of what Mahatma Gandhi said: “Be the change you want to see in the world”. I would urge everyone to be a blessing to others – when you help others; your own blessings are multiplied. And of course, there are few things as gorgeous as the smile on a child’s face, so if I can help to make a few children smile, it’s enough for me. You too can be an Educate A Child Champion and make a difference in a child’s life. Contact Precious Mbele on 011 482 1015 or preciousmbele@sparrowschools.co.za. A lot has been written in the media about South Africa’s recent unemployment slump, most of it negative. According to employment data released by Statistics South Africa on 26 May 2015, the unemployment rate in the country soared to its highest level in over a decade. Unemployment in the first quarter of 2015 has risen to 26.4% and more than 20 million people are not economically active in the country. According to earlier results from Stats SA, the youth continue to be the hardest hit by unemployment. Being the optimists that we are at Sparrow Schools we see opportunities in all difficulties. Through our partnership with industry we continue to champion the fight against unemployment and helping young people overcome difficult circumstances. Sparrow FET Automotive Repair & Maintenance graduate, Vernolia Breede was forced to drop out of school when she fell pregnant at a young age. Things got worse for her when she was hit by the harsh realisation that she would have to raise her baby as a single mother. Realising that she cannot just sit at home and wallow in despair, she heard about Sparrow FET’s Automotive Repair & Maintenance program and enrolled in 2014. Not only has Breede thrived in this male dominated automotive industry, she managed to be one of the two students from a group of 26, selected to serve as an Apprentice for Lazarus Motors. “I grew up tough so coming into this industry and adapting was not much of an issue. I know that if a man can do it, I can do it too”, Breede confidently says. 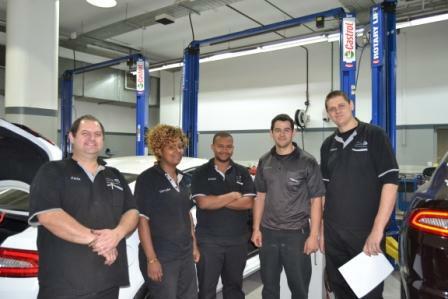 Since joining Lazarus Motors in January 2015, Breede’s future looks promising. She has worked under different Technicians who all sing her praises. “She is really hard working and has improved a lot since joining us. Apart from the fact that I can trust her enough to work alone, I see bright future for her here,” says Lazarus Motors Technician, Andries Roos. Breede’s life has improved dramatically since joining the Sparrow FET College. She adds, “looking at my baby grow up is also what motivates me and pushes me to be someone better.” She has her eyes on working her way up to becoming a Senior Adviser in the next 5 years. Breede is one among many graduates who have risen above circumstance and turned their lives around. 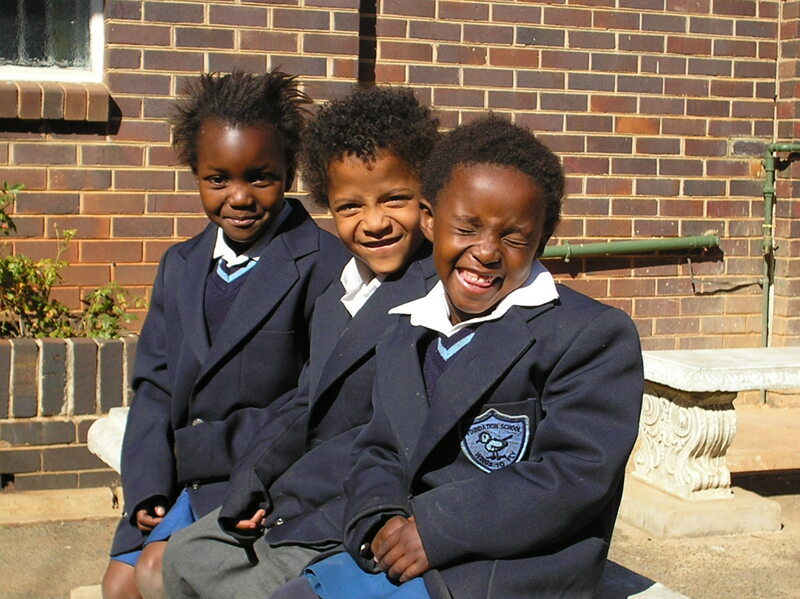 At Sparrow Schools, we aim to offer practical solutions to South Africa’s socio-economic challenges. We have programs and strategies which have proven to be effective in helping eradicate poverty and unemployment one step at time. We remain true to our mission to prepare children and youth living with learning difficulties to become income generators. We do this through comprehensive education and vocational skills training. 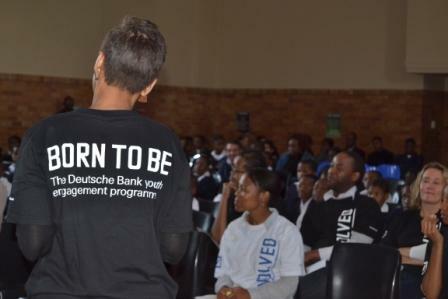 On 22 May 2015, The Sparrow Foundation School opened its doors to financial services giant Deustche Bank for a Do it Day project. As part of the bank’s Born to Be youth engagement programme, they visited the Sparrow Foundation School to give their time and donate books. The Born to Be program is aimed at equipping young people with education and developing their full potential. It is also aimed at empowering the next generation’s workforce and helping improve South Africa’s competitiveness on the world stage. The programme’s focus is on intervention on two stages of development in a young person’s life: early childhood and high school. The day started with the Born to Be representatives giving a talk on nutrition in the school’s hall. The team was then split and assigned to different classes were each Born to Be representative would assist teachers distributing books and reading for the kids. 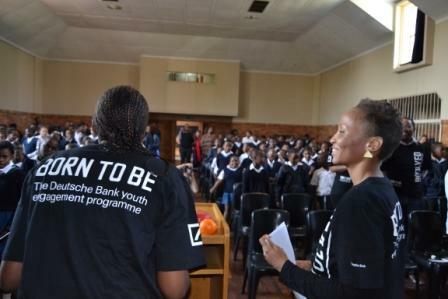 The Foundation School was thrilled to have hosted the Deustche Bank. It is through such partnerships and support from businesses that Sparrow Schools continues to thrive. Together we can improve the education and training of disempowered youth. This enables us to contribute to the larger objective of uplifting the country’s economy and the well-being of those marginalised in society. Sparrow Schools encourages businesses to join us in equipping young South Africans with skills to become contributing members of society. To find out more about adopting a project for a Do it Day, companies can contact our head office on 011 482 1015. South Africa has come a long way in trying to undo the effects of apartheid on our education system. We have just celebrated 20 years since the dawn of democracy yet disparities still persist and many remain excluded from the system. Many children and youth do not have access to education and live in dire conditions. Many who do have the privilege of getting access to education continue to be plagued by crime, poverty, and a lack of early childhood development support, hence the high drop out rates in our country. A child’s early years are important for development and laying a foundation. Many studies have been conducted which prove that effective childhood development yields “academic achievement, behavior, educational progression and attainment, and labour market success,” in the later stages of one’s life. At age 15, young Ashley Magutshwa has not allowed his circumstances define him. 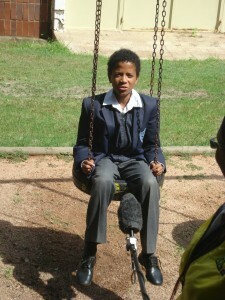 When he joined Sparrow Schools from the Ikageng Itireleng Ministry orphanage home, he had difficulties learning. Magutshwa and his sister were left stranded after the passing of their grandmother and were taken in by the orphanage home. He later found the perfect home in the Sparrow Foundation School. Through the multifaceted team of therapists from the Learner Support Unit offered by the school, Ashley has risen above his circumstance. 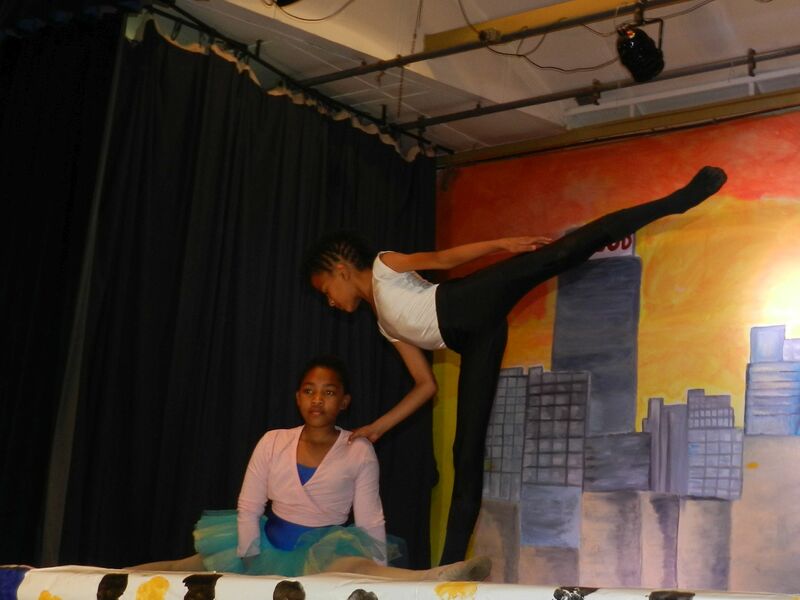 Eight years since joining the Sparrow Foundation, Magutshwa is now an active ballerino at the Johannesburg Theater. He is also a drama student at the National School of the Arts. He has featured in various plays including Cinderella and received numerous certificates. The 15 year old from Soweto now holds regular ballet classes for kids in his community on weekends. The young ballerino dreams of travelling to the United States after matriculating to pursue his dancing career. He has ambitions of spreading his wings, venturing into business and having his own family one day. He is testament to the fact that it is not where you come from that will determine your success. It is what you do now that will determine where you go. With 25 years of experience in the education and skills training field it is not hard to believe the great success stories that surface at Sparrow Schools. Triumphant stories of individuals that have risen above their social circumstances and succeeded against their learning challenges. Amongst such stories is that of Aphiwe Stungu, a 19 year old female that enrolled into the Automotive Repair & Maintenance program. 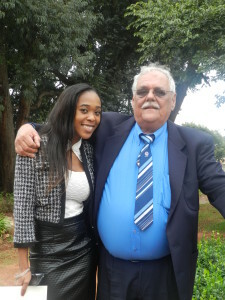 The Port Elizabeth born student thanks her uncle’s intervention for making her dream become a reality back in 2011 by insisting on the FET route. 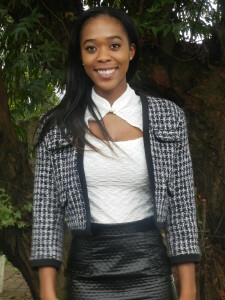 Young Aphiwe followed in her motor mechanic brother’s footsteps, “Seeing my brother fix anything made me fall in love with the Superwoman idea,” Aphiwe laughs. It wasn’t long till Aphiwe made a name for herself, impressing the facilitators with her ‘doing things properly’ attitude. Being the only girl in the program didn’t faze her she says and nor did it make it easy. The hard working lady says there were no favours received for her female card, she had to toughen up and get used to the realities of her chosen field. 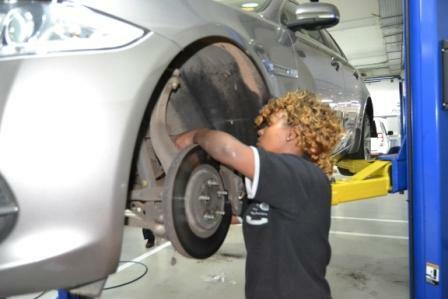 The good reputation carried over to the workplace where she was placed and enrolled with one of our industry partners- Germiston Kia Motors, through Imperial’s four years apprenticeship program. With each level she passes she gets an increase in wage, a great incentive for her to do well and take her studies seriously. Aphiwe completed her apprenticeship program and hopes to specialize in Diagnostic Mechanics and, who knows, maybe work for Ferrari as well. Jurgen Krause, her mentor and supervisor in the workplace says her work ethic, determination and ability to dream beyond her reality will be rewarded. Seeing Aphiwe climb up the ladder is great motivation for the staff at Sparrow Schools who work tirelessly in making a difference in the youth and country. We can’t wait to hear more from this lady on the rise. In 2014, the World Economic Forum global competitiveness report ranked South Africa at 144 for maths and science teaching out of 144 countries. The WEF’s report was later dismissed by various specialists as “preposterous” and flawed. It was found that the methods used to calculate the rankings were “Subjective, unscientific, unreliable and lack any form of technical credibility or cross national comparability.” However it is a well-known fact that South Africa’s education system is in crisis, especially in the maths and science categories. According to the Annual National Assessment results released in 2013, only 39% of grade six learners and 2% of grade nine learners scored more than 50% in mathematics. Some of the root causes of this failing system stem from primary and the way that mathematics is taught in schools. The remedial Sparrow Foundation School is constantly finding new ways of evolving and finding new ways to improve education. 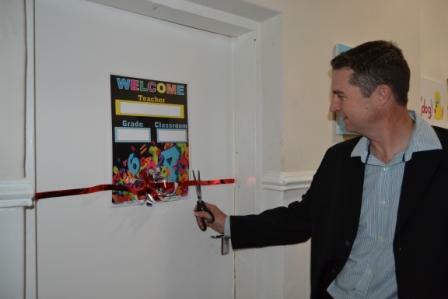 On 4 May 2015, the Foundation School launched its newly built Maths Enrichment Center at the Foundation School in Melville. The new center incorporates a Maths Enrichment program which aims to improve the levels of teaching and mathematical competence. It is equipped with superior teaching facilities and focused on the teaching of mathematics at grades 5, 6, and 7 levels. The center was made possible through the generous funding by General Electric and the Sparrow Foundation UK. “We at General Electric are very proud to see this place and what we have done with it. I would like to encourage you go into the center, work hard, get people to help you and don’t be afraid. Maths is a foundation for you to be great one day,” says Solutions Consultant Manager of General Electric, Andre Bodenbarck at the launch. The program aims to break down the stereotypes associated with mathematics as a difficult subject. Keeping in mind that the Foundation School is a remedial school, the program has been specially designed for the learner with learning difficulties. “The one thing that our learners struggle with is understand the reasons why they do mathematics. The programs we have in the maths center allow them to think in that direction. The program is also designed to allow the learner to develop at their own pace. It is unlike in the classroom where all the learners are expected to all develop at the same pace,” says the new Foundation School Mathematics specialist, Vincent Edwards Basson. Starting off as a qualified physiotherapist, Basson brings with him 27 years of teaching experience and 5 years working experience, working at district level with the Department of Education. He is also a mentor, coach and pastor. Sparrow Schools Educational Trust will host its fifth annual Spinathon fundraising event in partnership with Virgin Active at Milpark Virgin Active, Johannesburg. The Spinathon which takes place on 23 May 2015 will feature the crews from 5 FM, Isibaya, DJ Monotone, Lection and many more. 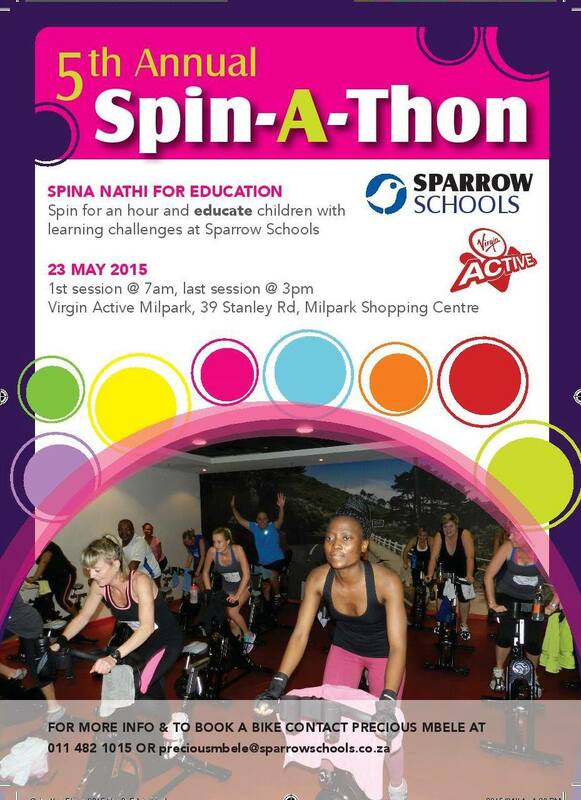 There will be eight one hour sessions starting from 7 am to 3 pm where Sparrow Schools invites companies, celebrities and individuals to spin and donate a R100 to our Educate a Child program (EAC). Many of our learners are from places of safety, child headed households or disadvantaged homes where parents cannot afford the special education their children need. The EAC program assists us provide education and support to children and youth experiencing life and learning difficulties. Work experience is one of the most crucial factors that can affirm a graduates’ competency and set them apart from the rest. The ability to place students on work experience whilst pursuing their training is part of the Sparrow FET College winning formula. 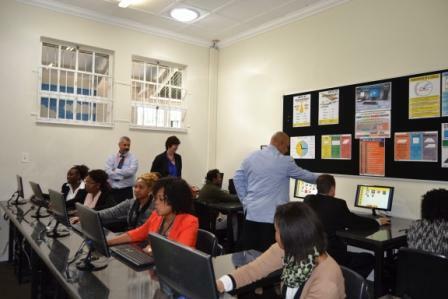 The FET’s partnership with industry and relevant SETA’s has seen many of its students gain work experience and often finding permanent employment. 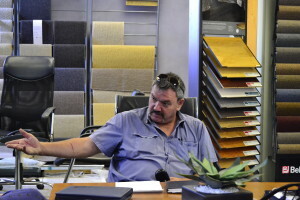 One such partnership has been with international flooring specialists, Peter Bates. The company has provided the FET College’s Installation of Floor Covering students with work experience for the past two years. A lot of times people would rather stay in their comfort zone and stick to what they know. Nokwe’s inquisitive nature inspired him to expand his skills and explore different floorings. 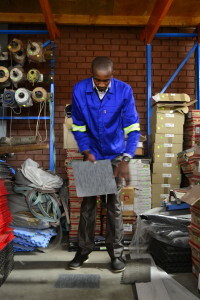 Luvuyo’s entrepreneurial demeanor prompted him to finding other ways of making money through marketing carpets. He would also sort boxes in the storeroom during his breaks to make extra cash. It was through this tenacity that Nokwe was able to learn the art of negotiation with team leaders. Currently working under a Sub-contractor team, with just over a year at the company, he is working towards leading his own team. He admits that when he got into the Installation of Floor Coverings program, all he cared about was receiving the monthly stipend. He soon thereafter came to understand that the experience would be crucial in the long run. 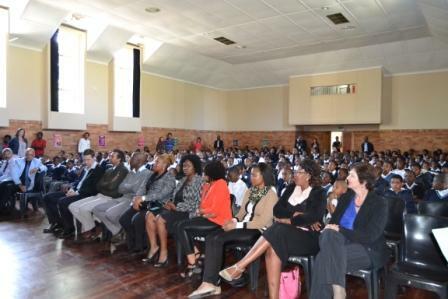 “Young people need to show up and expose themselves,” Nokwe says. Nokwe now enjoys the perks of getting to travel and experiencing new and different places across the country. He puts emphasis on the importance of maintaining a positive attitude and that it is the willingness to learn that sets one apart. “The money has its time and it comes once one has committed and sweated,” Nokwe explains. Help educate a child with learning challenges. Vote for the Sparrow Schools Foundation School plus stand a chance to WIN a R10 000 Woolworths Gift Card for yourself simply for voting! 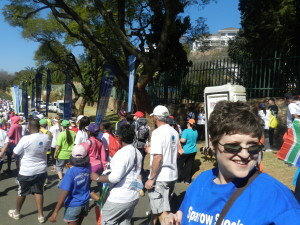 Visit http://www.myschool.co.za/vote4charity and select Sparrow Schools – Sophia Town. (Please note: You can only vote once). Insert your details and your MySchool MyVillage MyPlanet or Woolworths linked card number and submit your vote. Encourage your friends, family and colleagues to do the same. The South African Bill of Rights makes provision for children’s socio-economic rights. This includes the right to basic education and social services. However, according to Unicef’s early childhood statistical snapshot, over 200 million children under 5 years of age in low and middle-income countries – and increasing numbers in OECD countries and emerging economies – will face inequalities and fail to reach their full developmental potential. This is due to a number of risk factors including poverty which often can lead to heightened risks of substance abuse, crime and depression. Revamp of the Remedial Learning Center. To avoid these risks and consequences in the later stages of a child’s life, early childhood development should be a key focus for every country. Early childhood spans the period up to 9 years of age which is critical for social, emotional and cognitive development. If a child is left to grow up without the proper care and education, this can lead to irreversible damage and hamper development. By investing in early childhood education, South Africa can yield long lasting benefits. Studies have shown that early childhood development play a crucial role in helping mitigate the impact of adverse early experiences. Although South Africa still has a long way to go, it is not all doom and gloom. The Sparrow Foundation School realises the importance of early childhood development and has introduced a multifaceted remedial teaching centre. The centre will soon be extended to include a Maths Enrichment Centre and a Natural Science & Technology centre adding on to the existing Literacy Enrichment centre. The three centres are designed to accommodate every learner’s individual style and maximise the learner’s full potential to learn and acquire a new skill. 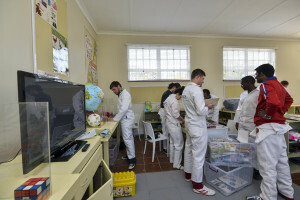 The multi-media Literacy Enrichment centre is designed to focus on the improvement of literacy levels among all learner’s enrolled in the Foundation School. The Maths Enrichment centre utilises blended teaching practices and instructional design, equipped with computer based teaching software. 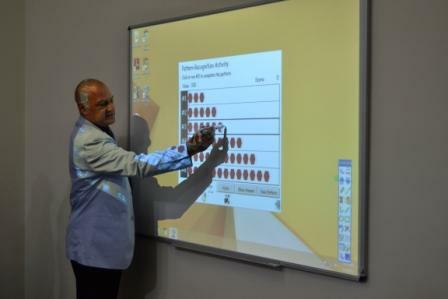 The aim is to improve numeracy levels among all the Foundation School learners. The multi-disciplinary and adaptable Natural Science & Technology Centre aims to expose the learner to various building blocks of the world around us and how they in our ever changing modern environment. The remedial centre will play a crucial role in helping produce quality human capital adding value to South Africa’s economy. It also ensures that the minority of learners with ‘special needs’ are able to compete and match up to those learners with ‘ordinary needs’.